The Meeting House offers meeting rooms that accommodate a variety of smaller events without compromising versatility and functionality. Rooms 300 and 400 are medium-sized rooms that can accommodate seminars, banquets, or small conferences. Smaller meeting rooms are ideal for use as breakout rooms during a large conference or for seminars and classes. The rooms are described below. Room 300 is a medium-size conference room (918 sq ft) that was completely redesigned and refurbished with upgraded finishes in 2015. The room is ideal for small conferences, receptions, worship, hospitality, seminars and more. It can accommodate 72 people auditorium-style, 40 people banquet-style with round tables, and 24 people classroom-style. Behind sliding panels that mirror the decor in Room 100, a 60" wall-mounted, flat panel smart TV with HDMI and WiFi connectivity and DVD player are available for audio-visual presentations. Free WiFi is available throughout the facility. A counter at the back of the room provides space for serving refreshments and buffet-style meals. Room 400 is a medium-sized room (500 sq ft) that can hold 48 people in an auditorium-style setup. The room is located at the back of the facility and is ideal for quiet services and small-to-medium speaker presentations or meetings. The pictured chairs have been replaced by the chair style in other rooms of the facility, allowing for greater flexibility in room set-up options. Portable TVs and DVD players are available for audio-visual presentations. Free WiFi is available throughout the facility. Room 10 is a medium-sized conference room (280 sq ft) that seats 16 or more in a U-shaped arrangement of five tables. The tables could also be arranged in a classroom or seminar style. It features exterior windows and a small counter for refreshments or materials. It is an ideal setting for a meeting or as a breakout room for a large conference. Portable TVs and DVD players are available for audio-visual presentations. Free WiFi is available throughout the facility. Room 26 (125 sq ft) holds one large, rectangular conference table with seating for up to 12 people. The conference table cannot be removed from the room and would need to be integral to the setup. Portable TVs and DVD players are available for audio-visual presentations. Free WiFi is available throughout the facility. Rooms 9, 11, 12 are similar in size (140+ sq ft), configuration, and price. They are ideal for small meetings or breakout rooms for larger conferences. Room 9 features an exterior window, an oval table and 8 chairs. Room 11 is an interior room that seats 10 around four tables in a single conference table configuration. Room 12 is an interior room with a window on the hall and an oval table and 8 chairs. Portable TVs and DVD players are available for audio-visual presentations. Free WiFi is available throughout the facility. Room 27 features four loveseats and a coffee table in an informal setting for a gathering of up to 8 people. The room can be used as a dressing room for weddings, commitment ceremonies and other events. 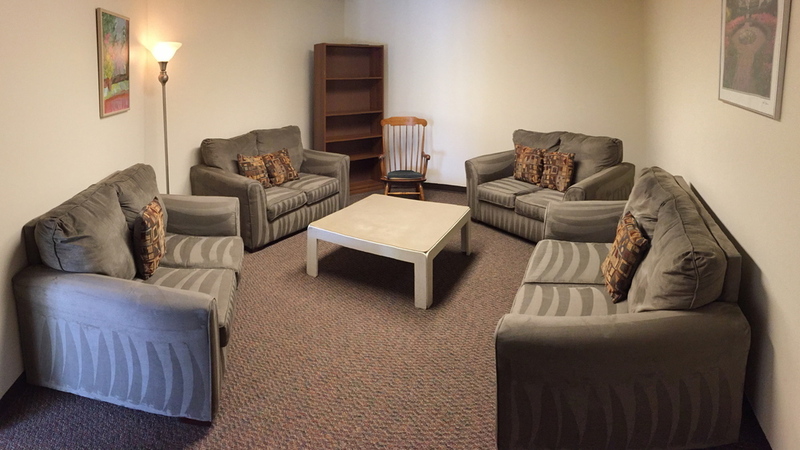 Due to the size of the loveseats, the setup of this room (125 sq ft) includes all of the furniture. Portable TVs and DVD players are available for audio-visual presentations. Free WiFi is available throughout the facility.